After we had successfully completed the 2,000 kilometers (1,240 miles) from Cairns to Brisbane, we were really glad to finally leave the Bruce Highway behind us. Driving such a long distance is not a real challenge for us (we drove 6,000 kilometers / 3,730 miles in South Africa) but travelling this distance on the Bruce Highway is a completely different story. The Bruce Highway is called a highway but the name is totally misleading – what it really is: a one lane street (with occasional passing lanes) that you are only allowed to travel 100 km/h (60 mph) with some exceptions where you are allowed to drive 110 km/h (68 mph) for a short distance. The ultimate problem though is the “unspectacularity” of the landscape surrounding Bruce Highway and the distance between towns (you cannot really call them cities in general although there are some cities located along Bruce Highway). The only things you see for 2,000 kilometers (1,240 miles) are sheer endless sugar cane fields (in which one of the most venomous snakes in the world, the Taipan, lives – which does not make it more spectacular watching it out of the car from Cairns to Brisbane because, of course, you don’t get to see one), gas stations (thank god they are well spread over Bruce Highway, we wouldn’t want to run out of gas on this tedious highway as walking to the next gas station might kill us – not because of the snakes but because of boredom) and lots of Maccas (the Aussie name for McDo). From Brisbane to Sydney it is a totally different story – the Pacific Highway is a lot more spectacular, the distance shorter (only 1,000 kilometers / 620 miles) and the speed limit 110 km/h (68 miles) interrupted only by the occasional 100. The Pacific Highway leads along the Gold Coast, which, as the name already says, accommodates many beaches with golden / white sand. 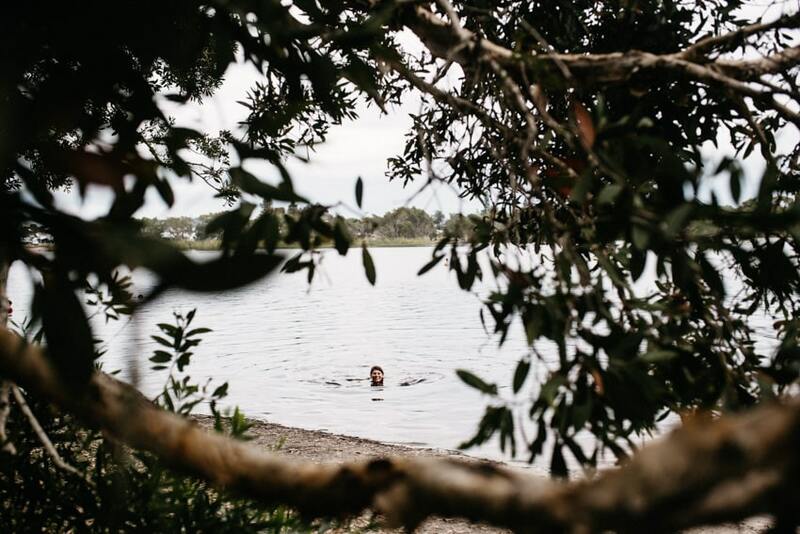 Swimming also becomes a more pleasant activity south of Brisbane as there are no stingers (stinger season is from November – May) in the water anymore (they only like it along Bruce Highway – for whatever reason). As we are not the real city tourism-addicts, we only spent one day in Brisbane. It was Christmas Day and we decided to escape rural / coastal Australia for one day in favor of a delicious, high-class dinner (real food that does not taste or feel anything like pasta or tuna or, even worse, a combination of it). We booked a table at the very nice restaurant “Pony Dining” directly at the Brisbane riverfront. It was basically the last fancy waterfront restaurant that had a table available – of course, we were late when we eventually changed from the “we could go for dinner on Christmas Eve”-mood to the “let’s book a table for dinner in Brisbane on Christmas Eve”-mood. We put on the best clothes we had in our rather small backpacks (we were not planning to go to any fancy place in the upcoming 8 months when we started our world tour, so the availability of fancy clothes was very limited). Bianca wore a black beach dress pimped it with a denim jacket and her KEDS sneakers and Tom took off his swimming trunks for the first time in two weeks and changed them for jeans and a T-Shirt. We looked more like hipsters than elegantly dressed people but that just supported authenticity – so, it was perfect for us. We spent the afternoon in the city; We strolled around the major shopping area – Queen Street Mall and the shopping streets surrounding it. Then we did a part of the Brisbane River Walk – leading you along the river with nice views of the skyline and the many boats. We even discovered the Koukabarra Showboat that offers dinner cruises (also on Christmas Eve) – we really wanted to do it but it was already sold out on the day we were in Brisbane. We also walked through the Bribane Botanic Gardens, which are not comparable in size and beauty to those of Sydney but still, are really worth visiting for a little walk. We had the best dinner we could possibly have had. We even added cocktails to our diet that evening. Alcohol is very expensive in Australia – so we never drank there (Tom even skipped the occasional beer since we arrived). In general, every kind of drug in Australia is super-expensive – one pack of cigarettes costs about 20-30 Australian Dollars. Anyway, Bianca discovered a PB&J (Peanut Butter and Jelly) Cocktail on the menu and had arrived in BC paradise within a sec. Unfortunately, they ran out of an ingredient for it, which led to the unavailability of the entire cocktail. She quickly found another pearl on the menu – a Banoffee Pie Cocktail (Banana & Toffee). It was delicious – the taste of banana and caramel … almost like heaven. The food was equally good – Tom had a steak, Bianca a red snapper and the desert was a chocolate mousse with cherry ice cream and lots of other fancy stuff. The next day, we continued our south-bound journey. It was Christmas Day in Australia – everybody was gathering in all the picnic/BBQ areas on the beaches, celebrating, exchanging gifts and enjoying quality time with the family. The disadvantage about this festivity in Australia for us was that everything was closed. So, we had to go a place that is different from all the other places and that never “sleeps” – Surfer’s Paradise. 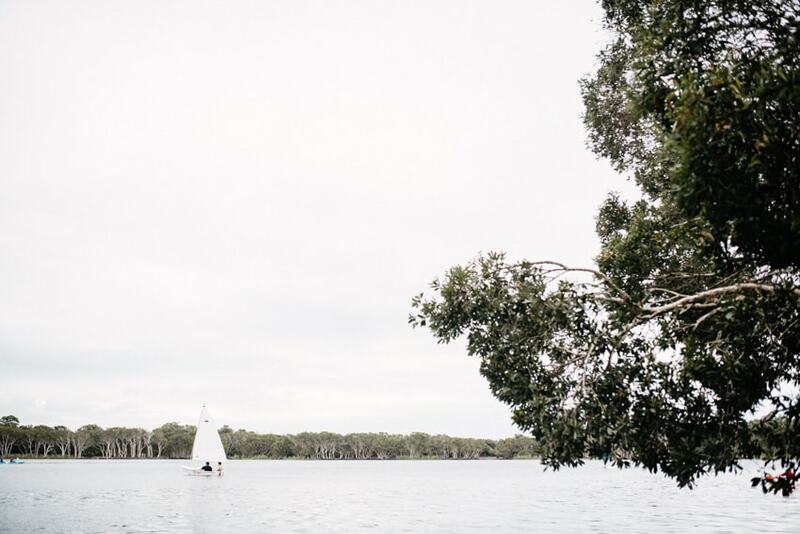 Australia’s Ballermann is neither a hidden gem nor the right place to spent a relaxing time with the occasional cultural, artistic or whatever intellectual input – it is a mere fun place (not as fun as Vegas but still, fun). The available activities are mainly centered around beaching, surfing, clubbing, partying and celebrating the greatness of life – or forgetting about the not-so-greatness of life. The esplanade is framed by the beach on one side and a massive skyline on the other (that looks lost despite its massiveness). 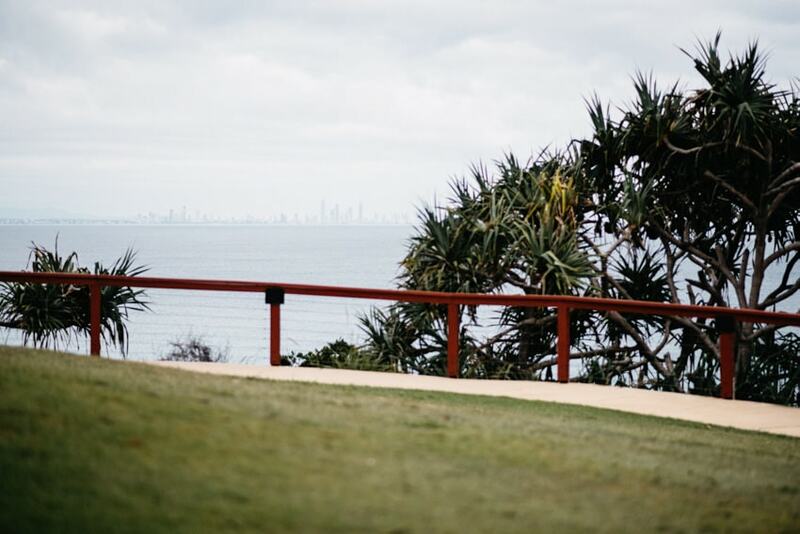 When you approach Gold Coast, it suddenly appears and when you leave, it disappears as quickly as it appeared – pretty weird. We spent an afternoon in town (to forget about the not-so-greatness of everything being closed) and walked along the beach esplanade, tanned our bodies (making flat stomachs, of course, to blend into the crowd) and walked through the city. We discovered a thong vending machine and counted more tattoo studios than anywhere else (walk-ins welcome). After three hours, we had a party people, tattoo studio and barefoot-tattooed surfer dude overflow and continued our journey. Before heading to our rest area for the night in Coolangatta (at the border to the state New South Wales), we took a little detour to Currumbin Rock Pools – a little creek 10 minutes from the town of Currumbin. The creek is basically famous for its cliffs that you can jump down from, right into the water. For those who do not want to join the teenage groups jumping down the cliffs, there is a tree trunk swimming in the middle of the water. You can try to stand on it or sit down on it and as soon as you do it, other people will come and spin the trunk so you fall off – very entertaining. It is not the nicest water but it is a nice place to visit as it is not touristy and funny to watch people jumping off the cliffs. 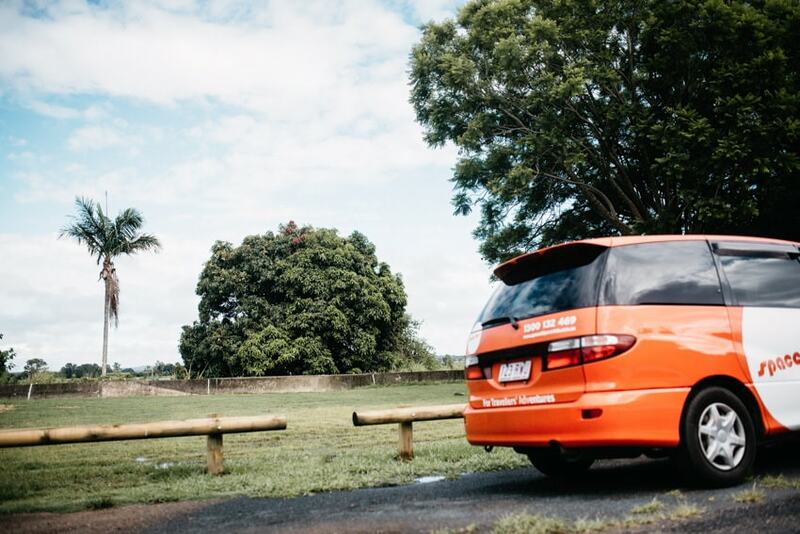 Our next stop was Byron Bay – according to Lonely Planet a place where it is hard to leave again. A day becomes a week, a week becomes a month, a month becomes a year and before you could turn around, you wear dread locks and stay forever. We kind of embrace essences of the hippie lifestyle but we don’t think dread locks are the most stylish (and hygenic) way to wear your hair. 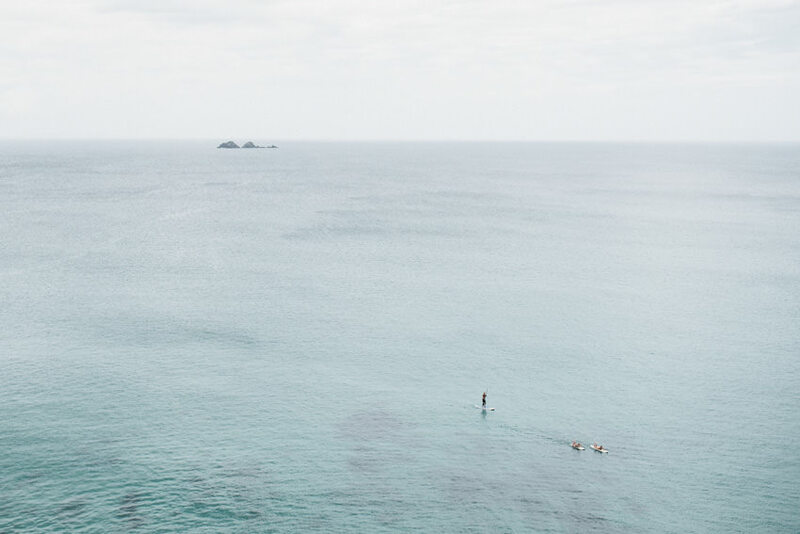 So, we did not expect a lot of Byron Bay – and were actually pretty surprised. The city reflects the perfect balance between the Hippie and the Surfer Lifestyle embedded into a wonderful landscape coined by coast and beaches. Byron Bay is, considering its size, a very cosmopolite town full of hip bars, restaurants and tour operators. You could basically spend a week in Byron Bay and do tours to Fraser Island and many more from there. There are also many gas stations, a huge Woolworths and an IGA grocery store (we did not like that one but still, it’s there) – so you can get everything you need. It is a wonderful place, however, in high season it gets really crowded and finding a parking spot can become a really though task (although one hour of parking costs 4 AUD). 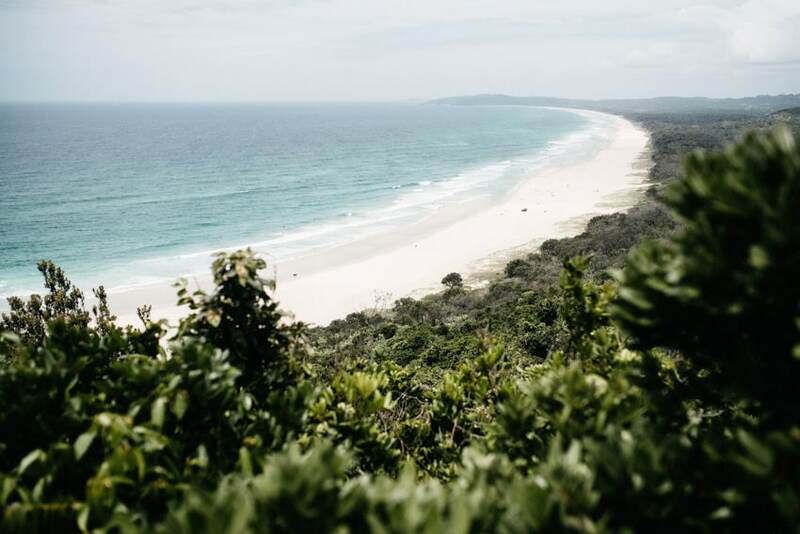 We decided to spent one day in Byron Bay and do the Cape Byron Walking Track. 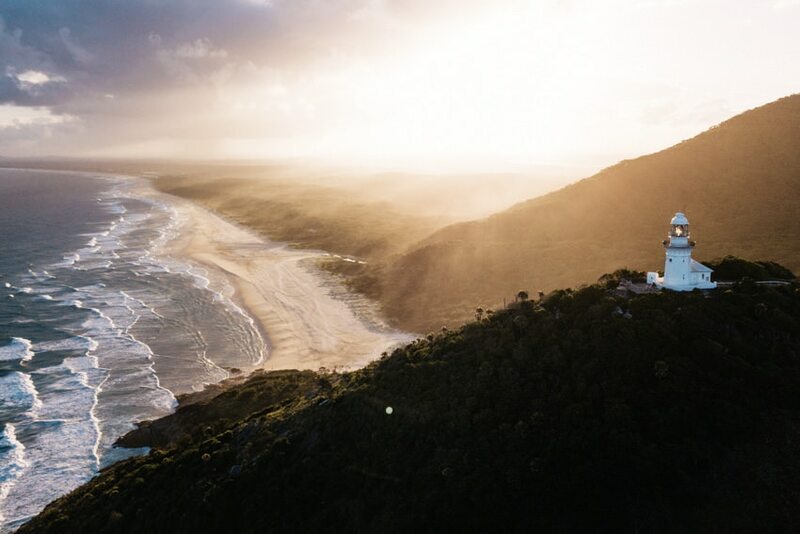 We read that the lighthouse in Byron Bay is a must-see and as the track covers the lighthouse as well as some other nice lookouts and viewpoints, we decided to do the entire track. It is a 3.7 km (2.3 miles) loop and takes about 2-3 hours to complete. There are several parking lots (e.g. directly at the lighthouse, at Brooke Drive next to the Pass Café, etc…) around the entry points of the track, however, all are paid (at least, we could not find any free ones). The good thing about the track is that it can be entered through several points and shortened if you don’t want to walk the entire loop. It is a nice walk and the difficulty depends on which direction you choose to do it in. We started at the Pass Café and walked up Lighthouse Road following the street until the Cape Byron Lighthouse. 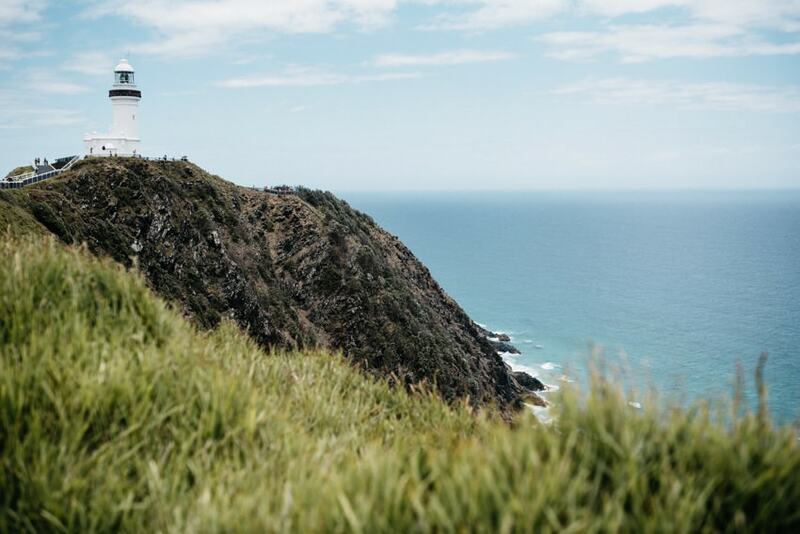 If you do it in the other direction – Cape Byron – it is harder as there are many steps that you have to climb up. From the lighthouse, we continued towards Cape Byron passing the Most Easterly Point of the Australian Mainland. 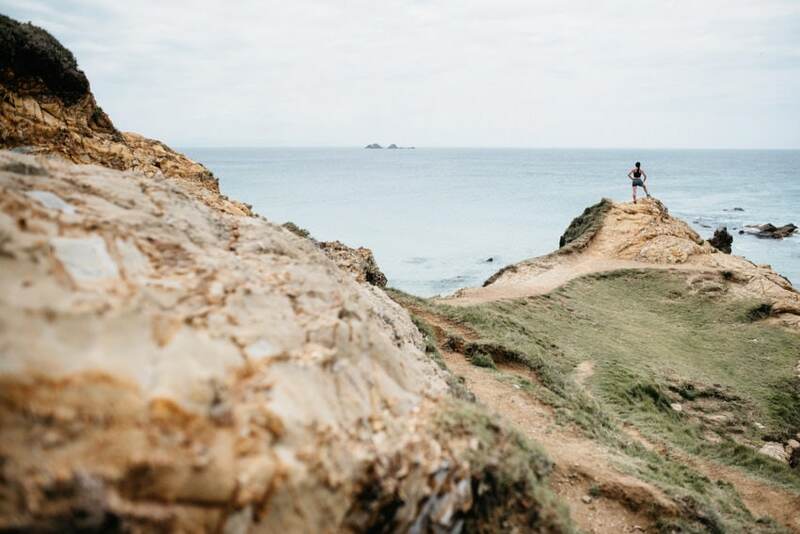 The track leads through rainforest, across clifftops and along several beaches. Cape Byron is a good place for dolphin spotting – we spotted 3. You can bring your bathing suit/trunks along as you pass several beaches and swimming is a good refreshment opportunity on hot and humid days. 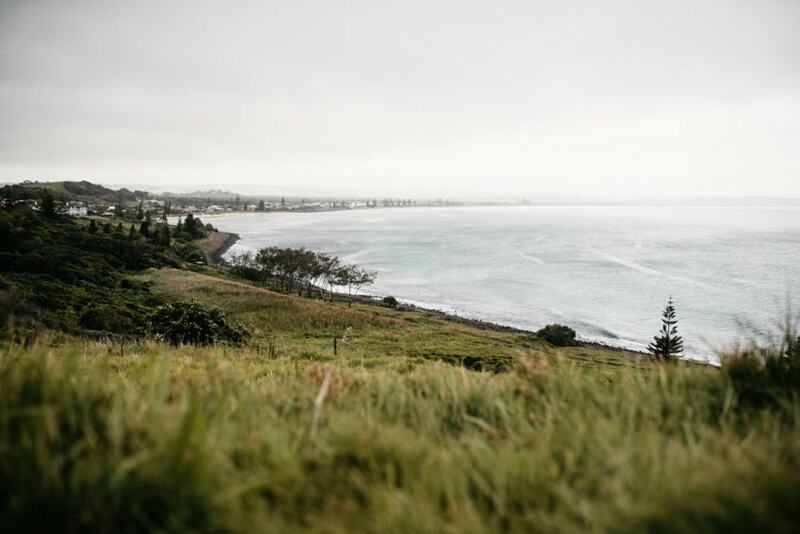 Our next stop was Lennox Head – south of Byron Bay and much more calm and relaxing. The beach in Lennox Head is very nice – not so crowded but still, lots of surfers in the water to watch. 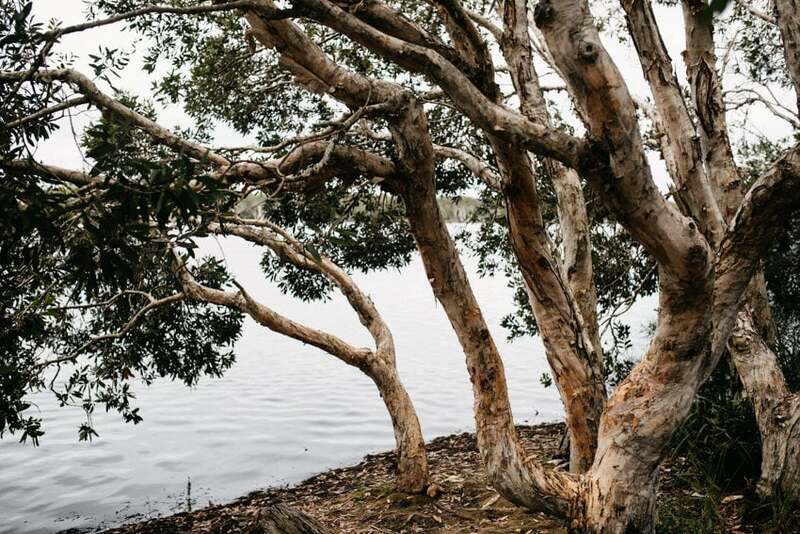 We did not visit Lennox Head for its beautiful beach though (we had seen so many beaches already that we slowly felt a beach overflow overcoming us) but for Lake Ainsworth. This is a very special lake as it is surrounded by tea trees – which does not sound very special. 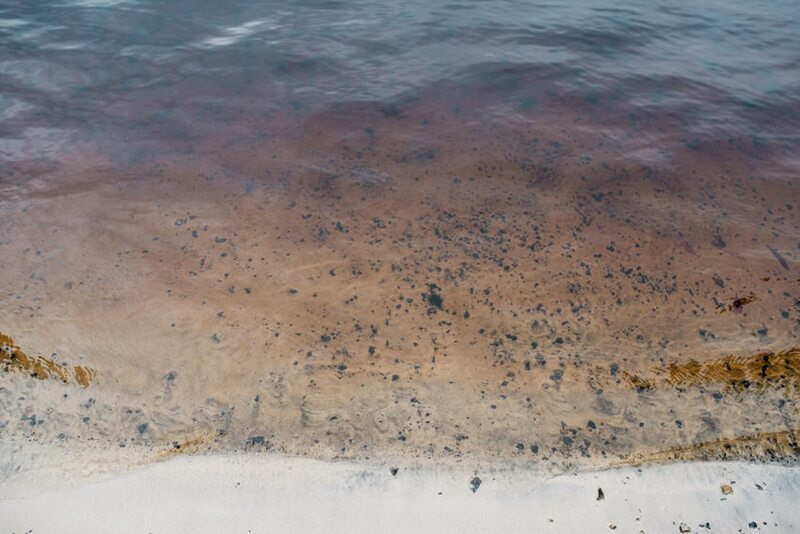 But, the water is colored brown by the trees, it smells a little bit like tea tree oil (at least we thought it smelled like it) and it is said to have a positive effect on your skin. We took a little bath in the lake – it feels a little bit weird because the water is so dark that you can’t see anything (after two steps into the water, your feet are out of sight) but also good because of the tea tree oil (it might be some kind of placebo effect but it really worked for us – our skin felt very smooth after the swim). 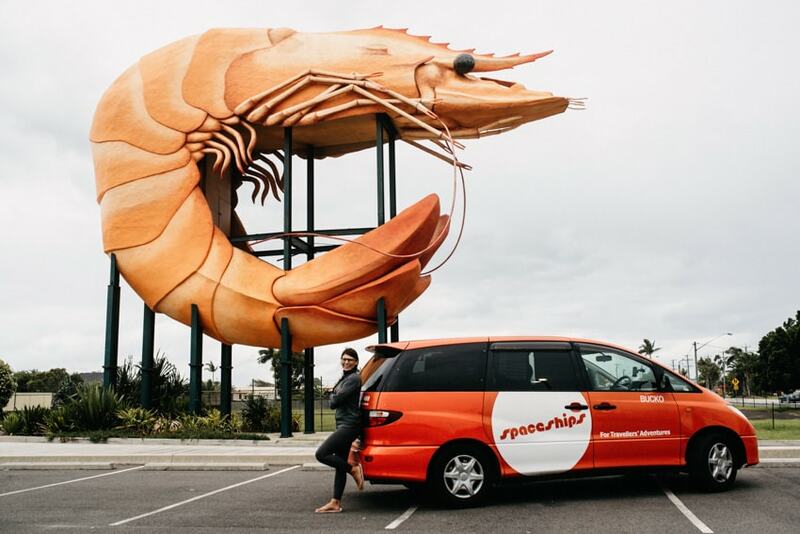 We quickly stopped at the Bunning’s Warehouse Ballina on River Street – not because we ran out of gas or needed tools – no, just to see the Big Prawn. Big things in Australia have a real cult status and so, more than 150 of these sculptures are currently spread all over the country/continent. Talking to a ranger about beach safety in Mission Beach, he informed us about the golden gumboot in Tully (not far from Mission Beach) and that we should go and see it. It is 8 meters (26 ft) high and was built in 2003 to represent the rainfall in the year of 1950, which was the record in Tully (one of the wettest cities in Queensland). We did not think it was beautiful (a golden gumboot with a green frog in front), which it truly isn’t. Later, we got to know that it is a big thing and that they are spread all over Australia. We passed the Big Banana in Coff’s Harbour but as we thought it was also pretty ugly (although maybe being one of the most beautiful big things), we decided not to put any of them onto our travel bucket list for Australia. Until we read about the Big Prawn in Ballina. The Big Prawn was already sentenced to death (by the local government) because of its desolate and bad condition some years ago. It was planned to be pulled down when more than 5.000 signatures were collected against the demolition. For this reason, the big prawn underwent a huge renovation in 2013 – costing 400.000 AUD – to be standing there today and shine in bright orange. It is not beautiful (at least not what we think is beautiful) but the story really convinced us so we had to visit it. Our next stop was the hippie town Bellingen and the Gondwana rainforest of Dorrigo National Park. Read about it in Part 2 of this article. We spent all nights along the Pacific Highway on free rest areas with our Spaceship Campervan. For Queensland, we received a really good map with all rest areas (motorist rest areas were marked separately as you are not allowed to park at a truck rest area overnight with your campervan) and driver reviver stations. For New South Wales, this map was not available which forced us to always look for signs along the highway. The available websites about rest stops in NSW also did not prove to be very helpful. All rest areas where we stayed were in a good condition and had a toilet.